Improve the efficiency and safety of your healthcare facility with proven medical equipment solutions from Creche Innovations. We lead the way in effective medical furniture that empowers your medical staff to deliver quality, consistent care. Among our line of products is the MicroCool® Refrigerator & Freezer, a space saving, drawer style unit that will improve your storage capabilities. Learn more about this medical-grade refrigerator and freezer below, and be sure to request an on-site demonstrations with one of our sales representatives. Your hospital or laboratory is a busy place. As such, it is often required that your facilities make the most out of storage. The MicroCool® Medical Refrigerator & Freezer is designed with accessibility and compactness in mind. Its smart and robust design allows it to be installed in a variety of spaces, which allows for seamless integration throughout your healthcare facility. It can be placed under counters, built into casework and headwall systems, and also mounted on the countertop. Of course, we can also create a custom mounting option that matches your needs. A quiet, serene atmosphere promotes better recovery for patients of all ages. However, while it is recommended that care facilities keep an operating sound level at 45 decibels or below, many standard-grade, medical refrigerators emit more than 50 decibels of noise. The MicroCool®’s proprietary, Whisper® Quiet Technology™ allows the compressor to operate at less than 30 decibels. As a result, your patient rooms will remain peaceful. The MicroCool® refrigerator & freezer emphasizes efficient performance. As such, you can expect it to maintain optimal temperatures even when it is not at capacity. The drawer design allows cool air to remain inside the unit, even when the door is open. The MicroCool® acts as both a medical and laboratory refrigerator & freezer, thanks to its intuitive temperature control dial. The dial enables a wide range of supplies to be kept at optimal temperature, including breast milk, essential fluids, medications, and test samples. Uphold the cleanliness and sanitation of your facilities. 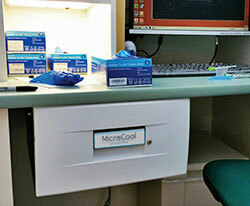 The MicroCool® Refrigerator comes standard with an antimicrobial cartridge. The cartridge keeps the refrigerator dry and nullifies the growth of harmful mold and bacteria. Used in the MicroCool® Freezer, this proprietary cartridge eliminates frost build up and offers nominal maintenance. The refrigerator & freezer integrates with any hospitals already established Temperature Monitoring System. If you do not already have a Temperature Monitoring System in your hospital, Creche's WiFi Remote Temperature Monitoring System ensures all installed MicroCool® units can be checked easily and quickly. This highly configurable software enables adaptable monitoring capabilities, which allows your staff to make adjustments whenever and wherever they are needed. Contact our company to request a consultation for our medical refrigerators and freezers. We proudly serve clients worldwide.